This tiny book (it fits into tiny young hands quite perfectly) takes readers around the world and explores how each culture celebrates. 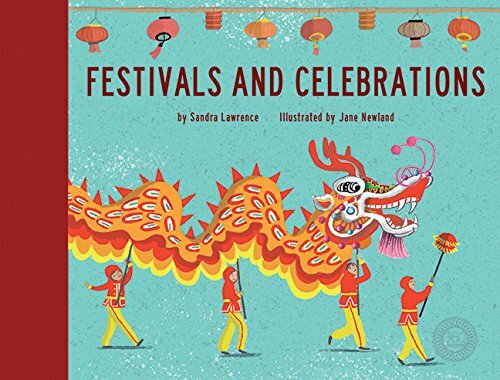 Celebrating is a universal experience, and this book takes a look at some of the brightest, funniest, and most beautiful festivals on the planet throughout the year. Traditional and modern experiences are shown with equal enthusiasm, and there are some hilariously funny traditions you probably didn't know even existed, like the Radish Revolution! What I love most about this book is that, even though it's an encyclopedia on celebration, it's small enough that readers can carry it around on their own journeys. The illustrations are minimalistic and loose but intense in color, so it has the feeling of reading a small book, but it stands on its own as a beautiful narrative piece that'd be fun to read for any occasion (literally). Festivals and Celebrations published last fall from 360 Degrees!